The northernmost of Cataloochee’s three valleys is Little Cataloochee, which is situated along a stream of the same name between Sterling Ridge and Noland Mountain. 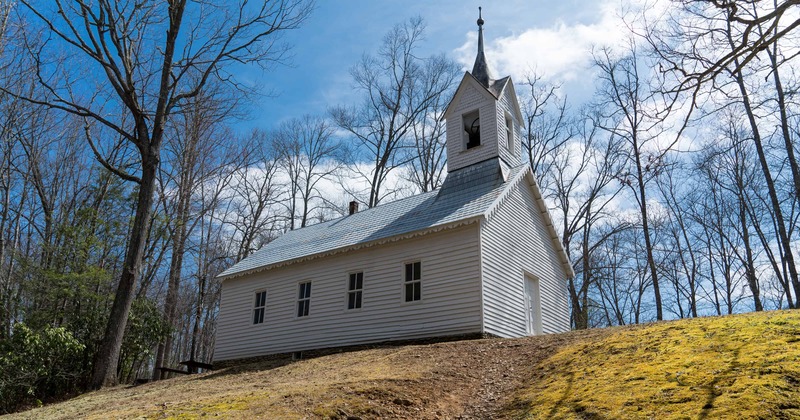 This hike features cabins, cemeteries, wildflowers, big boulders in Palmer Creek and Little Cataloochee Church chapel. If you’re looking for a good day hike that only takes around 5 hours this is the spot for you. Better yet, the trail head begins in Big Cataloochee Valley where you have a very good chance of seeing elk in the forest and the fields. Before the Great Smoky Mountains National Park came into existence there were settlers living in Cataloochee Valley from 1854 – 1930s. When the park boundaries were established the settlers were offered lifetime leases to their homes however major restrictions on logging and farming led to all of them leaving by the end of the 1940s. This hike will lead you to their old cabins and will feature many rock walls and stacks that were built when they began clearing the land for farming. Little Cataloochee Church sits at the 4 mile turn around point. It is open to the public and you can explore inside as well as the small historical cemetery to the right of it where you will find the tombstone of Daniel Cook who built the cabin mentioned in the Trail Insights below. This trail can be an out and back or one way with shuttle if you’d like to make it 6 instead of 8 miles but the driving time to get to each drop off may not be worth it unless you utilize a shuttle service such as Leap Frog Tours. Wildflowers begin blooming along the trail in early April such as Cut-Leaved Toothwort (Cardamine concatenata), Thyme-Leaved Bluets (Houstonia serpyllifolia), rhododendrons and ferns. This hike could easily be extended for longer hikes on connecting trails, pick up a Great Smoky Mountains National Park Map at our Visitor Center or your local outdoor retailer to find trials for further distances. Trail begins by taking Pretty Hollow Gap from the parking lot for 0.8 mi. This flat stretch sits aside the river and offers a few good spots to cool off or take a dip on your return. Take the Little Cataloochee Trail to the right and begin the gradual to moderately steep ascent to Davidsson Gap at 2.5 mi. You will see tie ups for horses and this is a good place to rest before heading downhill on the switchback. At 3.3 mi you will reach the Dan Cook Cabin on the left that was built in the 1850s. There is the foundations of an apple storage house to the right. Around 4 mi you will climb up to Little Cataloochee Cabin. The trail continues on to Hannah Cabin if you would like to extend your out and back length. Turn around at the church and head back the way you came. Trail crosses several creeks and can be very wet and muddy several days after recent rain or heavy horse usage. Reminder that dogs are not allowed in the Great Smoky Mountains National Park. From Exit 20 off I-40 in NC, almost immediately after turning onto Rt. 276, turn right to head west on Cove Creek Road. Roughly 4.7 miles from the turn-off the paved road ends and you’ll begin driving on a gravel/dirt road. The road is passable for low clearance, two-wheel drive passenger cars; however, you should expect some rough, washboard sections. You’ll just have to drive slowly. At 5.9 miles you’ll reach the Great Smoky Mountains National Park entrance gate, and at 7.6 miles you’ll arrive at the paved turn-off to Cataloochee. Turn left at this junction. 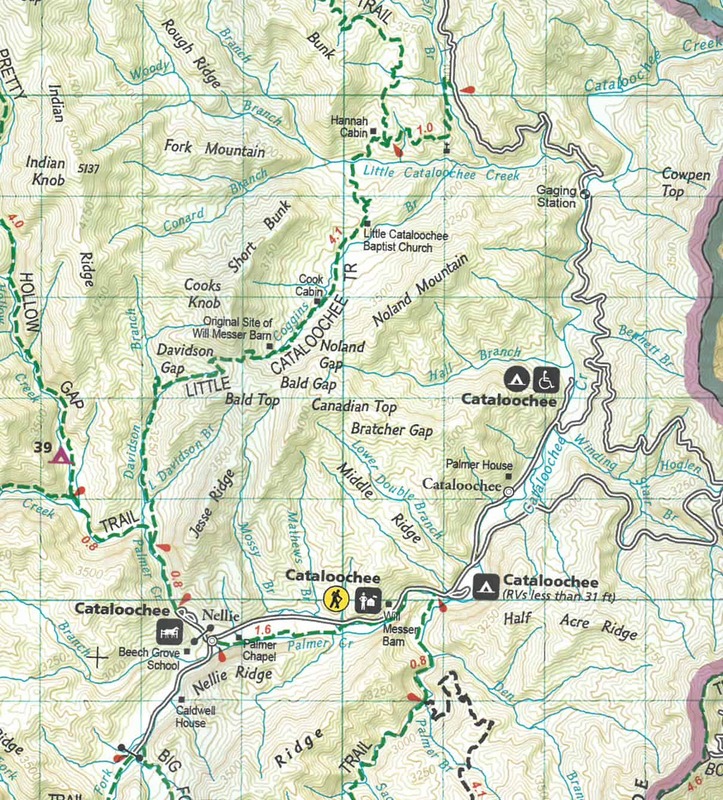 At 10.7 miles you’ll pass the Cataloochee Campground. Continue into the valley, and park in the area just before the schoolhouse and bridge.